Manado (AFP) – Health Minister (Menkes), Endang Rahayu Sedyaningsih, pointed to two hospitals (Hospital) in North Sulawesi (Sulawesi), RS and RS Kandouw Sam Ratulangi as a reference in the handling of bird flu. “In North Sulawesi there are two hospitals designated as referral hospital that could handle this case, each RS and RS Kandouw in Manado Sam Ratulangi in Tondano, “said Head of Controlling Health Problems of North Sulawesi Provincial Health Office, Dr. Jemmy Lampus, in Manado on Saturday. He explains, when these two hospitals designated as referral bird flu patients, its facilities have been improved.Among other things, provided a special isolation room patients, medical equipment and health personnel who provided special. “So in case of bird flu cases in North Sulawesi, such as, the case that just happened in the City Kotamobagu, patients suspected of bird flu should not be brought to Jakarta for get special treatment, “he said.Kandouw Hospitals and Sam Ratulangi will be a special isolation rooms for patients, said Jemmy. Even so, he said, until now the two hospitals could not be directly examined blood samples of suspected bird flu. Things like this do not only occur in two hospitals, but occurs also in all hospitals in Indonesia. “blood samples are sent and checked Agency for Health Research and Development, Ministry of Health Republic of Indonesia. This is done because of the limitations of existing technology in two this hospital, “he said. Kandouw Special hospital, said Jemmy, had also become one of the referral hospital for patients with swine influenza (swine flu) and Severe Acute Respiratory Syndrome (SARS). Earlier, 11 people Gogagoman Village, District of West Kotamobagu , Kotamobagu City, North Sulawesi, was treated at General Hospital (RSU) Kandou Manado for allegedly contracted the bird flu virus. blood samples were then taken and sent to Jakarta. After the blood samples examined 11 suspected bird flu negative. They’ve returned to the City Kotamobagu. JAKARTA: More than half of Indonesian people obtain food and daily necessities from traditional markets. Meanwhile, Indonesia’s traditional markets are identically so dirty that they are breeding animal-borne diseases. Traditional markets that are also a place for trade in poultry are the host for bird flu virus. To that end, Health Minister Endang Rahayu Sedyaningsih has asked the city district government to make the traditional markets into healthy markets. Endang explained that since 2005 been reported from several countries of Asia bird flu cases in humans are highly pathogenic. It has the potential to cause outbreaks or outbreaks with high mortality. Healthy markets ”become the prevention of disease transmission and prevention of bird flu transmission potential disease outbreaks,” she said in the ‘National Workshop on Traditional Market Revitalization into Healthy Market’ in Jakarta. To give support to the regents and mayors, the government has already developed a healthy market town pilot in 10 districts in nine provinces. This pilot program has been implemented since 2007 in cooperation with the European Union and the WHO. Operation of a healthy market has also been regulated in Decree No. 519/2008 of the Minister of Health Guidelines for Implementation of Market Competition. Recorded at this time, there are 13,650 traditional markets in Indonesia that are entirely managed by local governments. Health authorities inform that more than 250 kinds of diseases are transmitted through unsafe foods. Denpasar (Bali Post) – Beginning this coming October, Livestock Service (Disnak) the Balinese Province coordinating with Disnak all the regency/the city of Bali will carry out rapid test or the fast test simultaneously in the traditional markets that sold the poultry, including the birds market. This step to guard against increasingly expanded the spreading of the virus H5N1 the cause of the very potential bird flu illness threatened the spirit of humankind. The head of Disnak Provinsi Bali I Putu Sumantra, on last Tuesday (27/9) said, his side also asked for the community that bought the chicken and the other poultry to isolate the poultry that just was bought. For preventive efforts, the community was also appealed to to destroy or burn the remnants of the waste of the poultry after being cut up. “If being found had the poultry that died suddenly or it was suspected infected bird flu, we asked for the community as soon as possible reported to Disnak local,” he said. According to Sumantra, the case of last bird flu was found in three locations in the Jembrana Regency just recently namely the Satria Hamlet in Pande Village, Air Anakan Hamlet in Banyubiru Village, and Menega Hamlet in Dauh Waru Village. The number of chickens that died suddenly in the three villages covered 103 tails in the Satria Hamlet, 14 tails in the Air Anakan Hamlet and 3 tails in the Menega Hamlet. In the three same locations was carried out by the extermination of the poultry namely 25 tails in the Satria Hamlet, 25 tails in the Air Anakan Hamlet and 14 tails in the Menega Hamlet. Sumantra added, his side has coordinated with Disnak the regency/the city in order to increase vigilance for ward off expanding the spread of the case of bird flu. Moreover, his side also ask for to the quarantine side and KP3 to increase the supervision of the entry of the poultry from outside Bali. (Snip) Efforts to create such a virus in the lab have failed, and some virologists think H5N1 simply cannot do it. The work by Fouchier’s team suggests otherwise. They first gave H5N1 three mutations known to adapt bird flu to mammals. This version of the virus killed ferrets, which react to flu viruses in a similar way to humans. The virus did not transmit between them, though. Then the researchers gave the virus from the sick ferrets to more ferrets – a standard technique for making pathogens adapt to an animal. They repeated this 10 times, using stringent containment. The tenth round of ferrets shed an H5N1 strain that spread to ferrets in separate cages – and killed them. Peter Palese, a flu specialist at Mount Sinai Medical Center in New York City who has expressed doubts that H5N1 can adapt to mammals, is not convinced. “Ferrets are not humans,” he says. “H5N1 has been around for a long time” and failed to mutate into a form that can jump between people. US (WA): Feeling vulnerable after seeing ‘Contagion’? As the movie shows, when disaster strikes, nothing is more important to each of us than the safety of our loved ones. That’s why it’s important to prepare now. Make sure you have a family preparedness plan to help you protect your family during a pandemic or other emergency. This includes being prepared to stay home for several days or longer and stocking up on food, water and essential medications. he confirmed about the sharing of the H9N2 strain of bird flu-A/Bangladesh/0994/2011 (H9N2). The strain was found in humans in March and recently confirmed by US CDC after its sequencing. The Institute of Epidemiology Disease Control and Research (IEDCR) has detected the virus, mild in nature, through its countrywide surveillance. “But it has the potential to be a pandemic threat,” (Snip) the alarm, as the virus can reassort with H5N1-also ‘widespread’ in the country-with its changing strains. With the UN issuing renewed warnings and a Hollywood disaster movie stoking our fears, bird flu is back in the news. We meet the man who first warned of a pandemic 50 years ago – and who is worried again now. It is a warning that Webster, a virologist known as the “pope of bird flu”, has been sounding for more than 50 years, initially to the scepticism of his peers but to growing respect more recently. The virus that keeps Webster awake at night is H5N1. it was the resurgence of human infections in Thailand and Vietnam in 2003, followed by outbreaks on chicken farms across Asia, the Middle East and eastern Europe in 2005 that made H5N1 a household name, while the H1N1 swine-flu outbreak of 2009 prompted the World Health Organisation to declare a pandemic. “We were extremely lucky in 2009,” he says. At the same time, Webster insists, the threat from H5N1 has not gone away. On the contrary, if the latest the scientific data are to be believed, a new “mutant” strain of the virus, codenamed 2.3.2., has already moved from China and Vietnam to central Asia and eastern Europe, spread by migratory waterfowl. Meanwhile, in H5N1 “hotspots” such as Egypt, where another variant is endemic in the poultry industry, the virus continues to kill people in significant numbers. Webster, who is 79 and was raised on a farm in New Zealand, has spent half his life on the trail of bird flu. Based at the Department of Infectious Diseases at St Jude Children’s Research Hospital in Memphis, where he presides over the world’s only laboratory studying the human-animal interface in flu, Webster has incubated thousands of chicken’s eggs in search of life-saving vaccines and has fostered the careers of scores of researchers. Good thing it was just a drill. Emergency preparedness experts at the U.S. Department of Energy’s Argonne National Laboratory have helped the Chicago department plan its response to potential catastrophe, including swine and bird flu epidemics, plague outbreaks and anthrax bioterrorism. Chicago, as one of the four largest cities in the nation, is required by the U.S. Centers for Disease Control and Prevention (CDC) to run periodic exercises demonstrating how effectively they would respond to public health emergencies. Local hospitals often join the exercises, as well as the city’s Office of Emergency Management and Communication. Even O’Hare Airport, a likely gateway for viruses from around the world, has played along in the past. This particular exercise followed the spread of an imaginary flu from Egypt. By the time the flu “arrived” in Chicago, more than 15,000 cases had been reported worldwide. Reports of an outbreak at an area nursing home kicked off the Chicago scenario. This is classic Hollywood and not close enough to the truth of an H5N1 pandemic. Or a pandemic in close comparison to H5N1. I was disappointed they didn’t do more with it. I was expecting a hard hitting movie, but instead go classic Hollywood fluff. I have always maintained that Hollywood can do a much better job with movies like this if they wanted to and not panic people. I was also disappointed at the number of people in the theater. My main goal is to get people to prepare for emergency situations no matter what it is and I’m going to tell you 3 days of food and water isn’t going to cut it. I still don’t know why FEMA, our Gov, and the Red Cross still push that! What natural disaster that you know of last for three days, and you might have people with you? Two weeks, folks. Two weeks is the bare min. you should have emergency supplies. I’ve been through too many emergency situations and a major ice store (no power and phone for 13 days) to understand that you need more than 3 days food and water. For the more serious of preppers, one month. If you are prepared for an emergency/natural disaster, you are prepped for just about anything. I personally take prepping seriously, knowing full well that survival and comfort of my family will depend on how well we prepared. In a pandemic where CFR is high, (comparing with the 1918 pandemic) you will not go out in public and will need to depend on yourself. If you are in a natural disaster and can not get out, you will need to depend on yourself. Being well stocked makes sooo much sense. I can only hope that it becomes the norm of our existance. If you haven’t seen Contagion yet but plan on doing so, don’t expect the movie to be hard hitting and thought provoking. If you have seen it I would love to hear your thoughts on it. Thanks for checking in with Flu News Network. Join us Thursday, 8 September, at a special time—2 p.m. EDT, for a chat with journalist and author Laurie Garrett, who has covered infectious diseases for more than 30 years, and W. Ian Lipkin, a neurologist at Columbia University who has helped identify several new infectious agents. 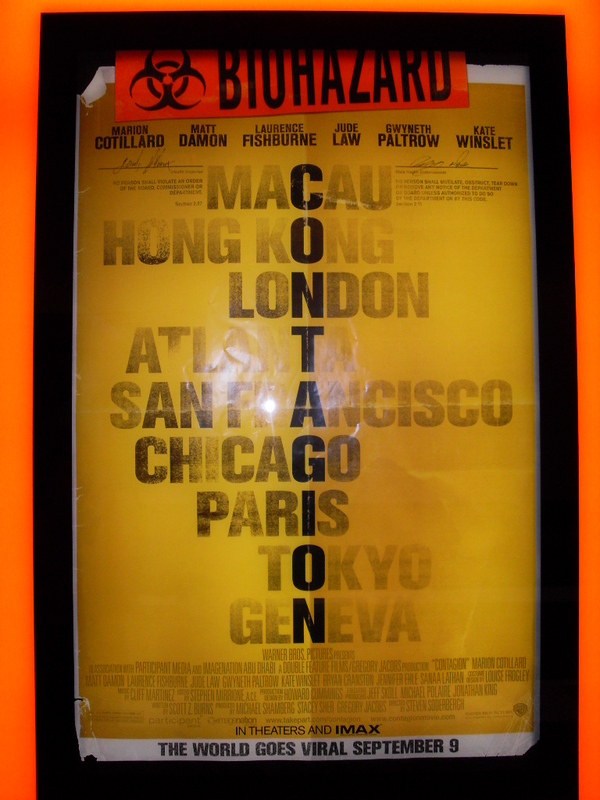 Both Garrett and Lipkin consulted with the makers of the new Steven Soderbergh film Contagion, which opens nationwide this week and attempts to accurately portray the scientific and public health response to an outbreak of a new virus. You can leave your questions in the comment box below before the chat starts. TRIBUNNEWS.COM, Kotamobagu – Shocking. The virus known as H5N1 or bird flu disease spread by birds that are known and are very harmful to human health, is found in chicken farms, Anwar Mamonto, residents Gogagoman, Kotamobagu North Sulawesi. The results of the examination, as many as 25 of 26 chickens belonging Anawar tested positive for H5N1 virus turns out that the chickens immediately destroyed.Not only that, Anwar Mamonto along with nine family members had taken to the hospital Kandou in Manado, on Sunday (04/09/2011), diagnosed with a fever as symptoms of bird flu victims exposed to visual acuity. Chief Medical Officer Dr. Salmon Helweldery Kotamobagu MA when he said, the current family of Anwar’s condition has improved. High fever that previously plagued the 10 people has now been dropped. “There were four women and six men, their families Mamonto Mr. Anwar who is also chairman of the RT VII. Their situation has improved, but for the test results have not been there,” said Salmon. The suspect bird flu was initially taken to the hospital Datoe Binangkang. RS Kandou di Manado. But because there is no end of equipment referred to hospitals Kandou in Manado. Until Monday (09/05/2011), Gogagoman residents are still being treated in hospital. Head of Livestock Department of Agriculture Fisheries Forestry Plantation Animal Husbandry and Food (DP4K2P) Kotamobagu Nurachim P Mokoagow said initial reports of bird flu came from Anwar who is also Chairman of RT Mamonto Gogagoman VII. “On 3 September we do a rapid test or rapid testing and September 4, results 25 of 26 chickens tested positive for the virus. We immediately destroy all the chickens,” said Nurachim on Monday (09/05/2011). In accordance with Standard Operating Procedure (SOP) or standard procedure, DP4K2P any spraying disinfectant around the scene of a radius of 200 meters. But for culling chickens in the neighborhood, the DP4K2P difficulty because there must be the owners permission. Nurachim added, Department of Agriculture and Livestock and the provincial health office will review the site plan. The province will also come down to check,” he added. In addition to the Gogagoman, DP4K2P will examine the chickens in Mason. Information received by the agency, in the area there are also chickens sudden death mortality. It is said, the problem of bird flu had also occurred in Kotamobagu April. In fact, the laboratory of Maros, Makassar, SulawesiSelatan (Sulawesi) also had a chance to intervene. Kotamobagu own municipal government directly coordinate with the two districts bordering the Bolaang Mongondong (Bolmong) and East Bolmong (Boltim) to improve surveillance of poultry into the territory of each. “We have contacted the Public Relations Section of the two regions to be more wasapada. Based on the information we received, the chickens are infected with the virus originating from outside the region,” said Head of Public Relations Local Government Supreme Kotamobagu Adati. It is said, the municipal government has re-enable postal Kotamobagu poultry surveillance in border areas. This is intended to prevent entry of birds or animals infected with the disease. Bird flu virus (H5N1) has hit back in Kotamobagu. This time the attacks are far more sinister than the first event in late April. The first attack only resulted in dozens of poultry that had to be destroyed, this time 11 people in Kotamobagu had to be sent and treated in the department of special (General Hospital), Prof. dr Kandou, Malalayang Manado. The 11 bird flu suspects are known to consist of three families (Head of Family). Sadly, these three families are still bound by kinship. Starting from the husband-wife, child, grandchild, son-in-laws up to the job of one family. The homes of the victims of this H5N1 virus attack are located in the Village District Kotamobagu Gogagoman West and East Village Kotamobagu Kotobangon District. The AI-infected suspect patients are AM aka War (58) and his wife, Mrs. NM aka Nur (55), then Mrs OM (48), OM (58), FM (29), and CHM. The six of them are citizens of Village Gogagoman Lorong Kembang. Then five residents at Kotobangon are HK (30) aka Rah, who was four months pregnant and her husband, AM aka Af (31) and their eldest son AM aka Naf (3), with both parents of Rah. Ie, the initials MK aka Mus (58) and his wife, Mrs. NM aka Nen (54). As for the bond of brotherhood among these patients, it is because the eldest son of War and Mrs. Nur ie Af, married with Rah. The woman who is now pregnant with baby 4 months old, is the son (daughter?) of Mus and Mrs. Nen. Mus himself is known to be a retired civil servant in one of the agencies of Bolmong Pemkab. Even positions that never bears when it is strategic enough, the secretary of the department. Based on information gathered from comments, the first outbreak was on Saturday (09/03) last week. That day, the body temperature attacked Mrs Nur and CHM with a high heat followed by a cough and runny nose (flu). Both were immediately checked by their health physicians. There Mrs. Nur unexpectedly met her eldest son, namely Af, who drove his wife, Rah, for the same illness. In fact, Mrs. Nur and CHM live in Gogagoman, while Af and his wife settled in Kotobangon Rah. Over time, other family members also begin to develop the same disease: high body temperature, coughing with flu. Finally, as if on command, they went to hospitals Datoe Binangkang. At the hospital owned by Regency Bolmong this, they were given a makeshift treatment. Moreover there is no special room prepared at this hospital. On Sunday (09/04) afternoon at around 15:00 pm, the Public Health Service Kotamobagu decided to refer the patients to the RSU 11 Kandou.